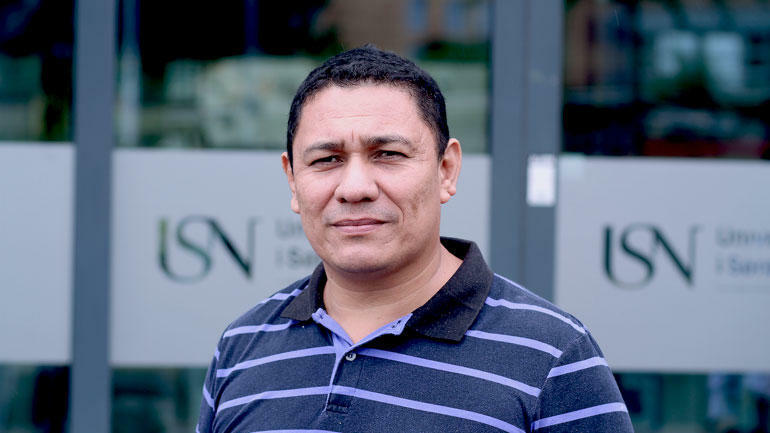 Israel Ramon Zelaya forsvarer doktoravhandlingen sin 29. juni ved USN campus Vestfold. Using a multimodal approach to empower Nicaraguan Rama schoolchildren to learn and use their ethnic language. Tittel på avhandlingen er: Using a multimodal approach to empower Nicaraguan Rama schoolchildren to learn and use their ethnic language. "A comparison of different research-based approaches to foreign language teaching"
Professor emeritus Arne Engelstad, USN, har vært komitéadministrator. Graden avlegges ved Universitetet i Sørøst-Norge (USN), Fakultet for humaniora, idretts- og utdanningsvitenskap i doktorgradsprogrammet i pedagogiske ressurser og læreprosesser. Historically, the Rama people, one the three remaining indigenous groups of Nicaragua, have suffered political and cultural oppression, which has resulted in the severe endangerment of their language. So far, several studies have been carried out on the description, documentation and sociolinguistic analysis of this language. Teaching materials have been produced; however, owing to the complicated sociolinguistic situation and because the Ramas have no literary tradition, one of the problems that linguists have faced when trying to revitalize this language has been the illiteracy level in the area. This dissertation explores the implementation of a social semiotic multimodal approach to the revitalization of this language. Furthermore, this method takes into account pedagogic principles of Freire and Montessori to structure a model that allows illiterate teachers of the language or those with little or no formal training to integrate children into sessions where critical reflection through creative art can enhance the revitalization of the ethnic language. This dissertation describes the model that we call the Rama Language Workshops where art and language learning are integrated through a series of steps departing from a reflection on a theme related to children’s reality, which in turn is transformed into a visual representation. Later, the teacher of the ethnic language can use this visual representation as a prompt to teach the ethnic language. With this study, I expect to contribute to the efforts of the revitalization of this language in two ways. First, I want to present a practical approach to the teachers of the Rama community, so that they can implement it regardless their lack of formal training as teachers. Second, I want present evidence for the academic community that a social semiotic multimodal approach combined with pedagogic principles of Freire and Montessori can be functional in the revitalization of an endangered language.